Swindon Town midfielders Drissa Traore and Jeremy Balmy have apologised after appearing to inhale nitrous oxide in a live social media video. 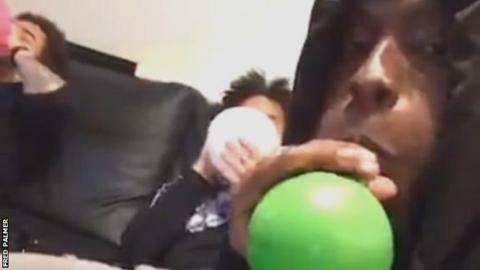 The duo and Brandon Ormonde-Ottewill were suspended by the club after images emerged on Wednesday appearing to show them taking the legal high, commonly known as laughing gas, via balloons. Traore, 24, said on Twitter that he "begged for forgiveness". Balmy, 21, added: "I am already learning from this mistake." All three will miss Swindon's League One trip to Bradford City on Saturday as they look to end a run of six games without a win. Between 2006 and 2012, 17 people in the UK died after taking nitrous oxide. A new law designed to crack down on legal highs was set to come into force but has been delayed. Then Liverpool boss Brendan Rodgers said he would speak to England forward Raheem Sterling, now at Manchester City, after he was pictured allegedly inhaling nitrous oxide in 2015. Drissa Traore: "I take this opportunity to apologise to all of my team-mates, staff and fans of Swindon Town. "I have made a stupid decision which is well documented and I beg for forgiveness. "I have let myself, my family and more importantly brought Swindon Town's name into the news for the wrong reasons. "I accept the decision of Swindon Town and any punishment to come, but it has hit me hard. "Being unable to do the thing I love as a footballer and not being able to prove myself on the pitch and repay the faith of Swindon is already hurting. "I hope I can soon be back in the shirt and show how much the club, fans and my team-mates mean to me. "Sorry I cannot be a part of the team tomorrow, good luck to the boys." Jeremy Balmy: "I would like to apologise to Swindon, to all of our fans and to the team for our silly behaviour from the other night. I am already learning from his mistake. "We do not undermine our results at all. I am sincerely sorry. "I hope my apologies will be accepted and I'll make sure not to misbehave or be disrespectful ever again. All my support to my team for tomorrow."